Lonely Planet is a familiar brand in the travel guide space, and they've recently launched a new book devoted to the world of cruising. They sent me a copy of The Cruise Handbook so I could flick through it, find out where it sits in the growing library of cruise guides out there, and to see whether it's any good for cruise newbies and seasoned sailors alike. 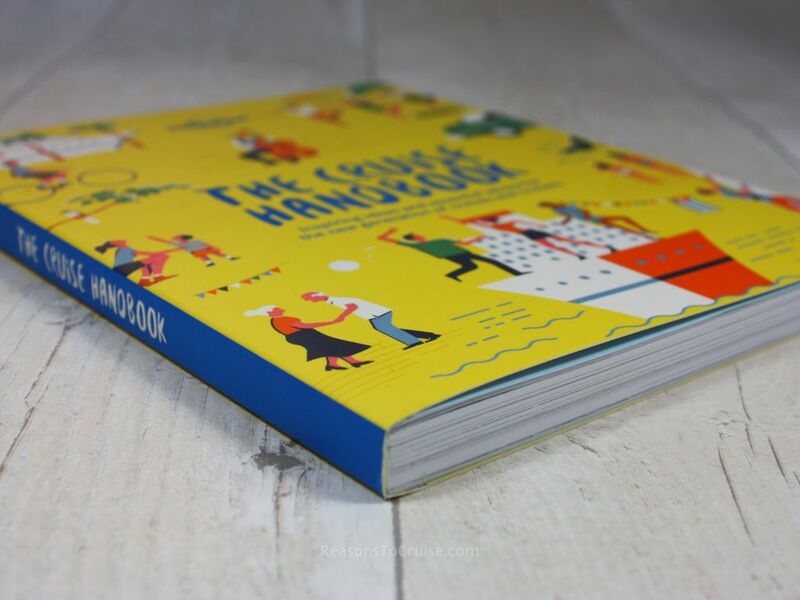 The book was released in January 2019 and is the latest in a string of travel titles by the Lonely Planet label. 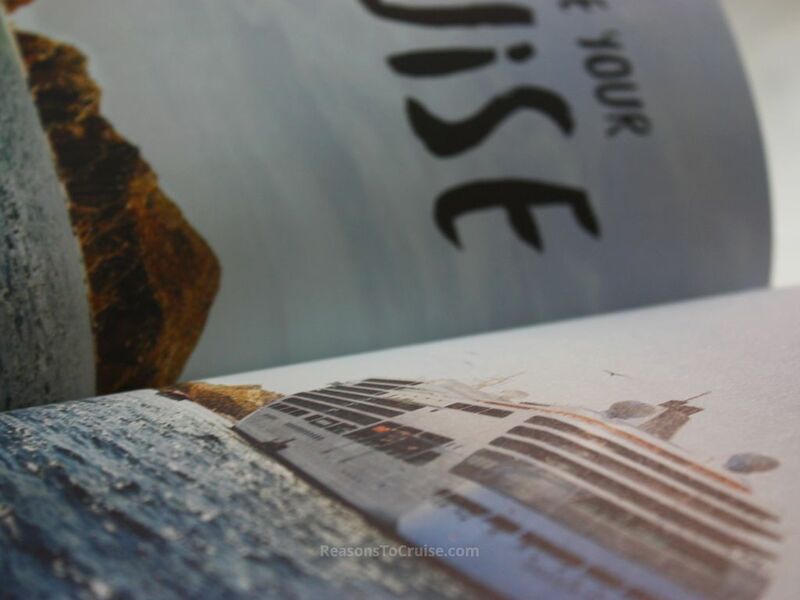 The brand is famous for its detailed location-focussed travel guides, and while it has released books on cruising to Alaska°, the Caribbean°, Northern Europe°, and Antarctica°, this is the first book that deals with cruising as a whole. The book is split into four distinct sections - information, planning, inspiration, and locations. The introductory information introduces the reader to the world of cruising, explaining a bit about what life is like onboard, what facilities to expect to find, how much a cruise holiday typically costs, how modern cruising has evolved, and what types of cruises are available (such as solo cruises, themed cruises, etc.). Clearly, the stand out section for me has to be the article entitled "Top 10 reasons to cruise" (a topic I'm familiar with!). Into planning, we learn about what to pack, shore excursions, and cruise ship etiquette. Cruise holidays may now bear little resemblance to the former, stuffy variants, but the etiquette police are still in force, and this chapter deals will the common rules of the seas. Inspiration, as you would expect, is full of recommended itineraries based around certain themes or preferences. So whether you are planning an LGBTQ cruise, you want to go island hopping in search of the best beaches, or you want a cruise that's perfect for tweens, flicking through this chapter is a must. Obviously, as printed material, it doesn't list currently available itineraries, and so it generalises a bit here, but there are normally cruise itineraries available that broadly match the suggestions in the book. 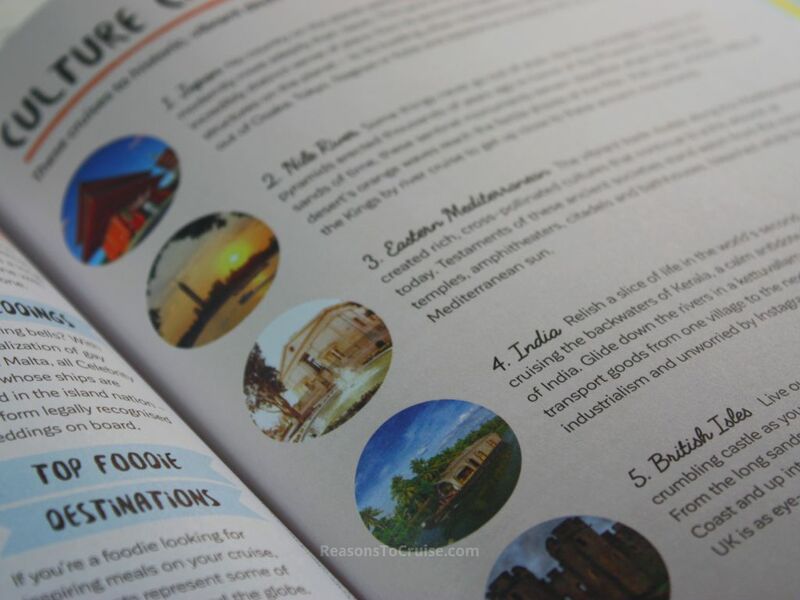 Lastly, locations spans the globe by region, detailing the must-see attractions in that location, along with suggestions on operators that usually offer itineraries to that location. Don't expect as much depth as you'd find in a dedicated Lonely Planet guide on that region though, as there's just not the space to cover the topic in that amount of detail. "Don't judge a book by its cover" goes the idiom, but it's hard not to when the bright yellow cover is awash with doodles of cruise ships and pastimes. The strap line states "Inspiring ideas and essential advice for the new generation of cruises and cruisers," and this is key. This cruise bible isn't another run-of-the-mill travel guidebook that glosses over many of the questions new cruisers have, and it certainly does not drone on about stuff that really doesn't matter. We millennials like our content clear and concise, and this book delivers precisely that. Reading the book, I was drawn from page to page. It's a colourful cacophony of hints and tips mixed with beautiful photography and magazine-like styling. Hats off to the designers, they worked overtime on getting the typography and design just right. That's not at the detriment of the content either. The text is clearly written in a conversational tone, so you will want to read cover-to-cover - or at least I did. Presentation aside, the substance is there too. The book begins with brief articles on the history of cruise holidays and popular cruise myths. It also touches upon issues such as sustainability and carbon footprints, an issue which could easily fill a book alone. Despite being 2019, cruising is still normally priced based on two sharing a cabin, so there's practical guidance for solo travellers at the beginning, and for families later on in the book. Don't skip the article on budgeting too. There's also a really good section on accessibility, an especially useful guide given many of the older cruise ships are not fully accessible. The book continues on to a rather handy calendar showcasing what cruises are usually available in regions around the world each month. This is ideal to consult if there's a certain place you wish to visit or if you are looking for inspiration on what to do next October (that would be Canada and New England in case you wondered). Reading on, the book turns from the theory into the realm of practical application. Articles cover the importances of packing carefully, navigation through the curious world of cruise ship etiquette, and introduces the idea of shore excursions, which is often a daunting and confusing proposition for newbies. All of this is covered in around 60 beautifully designed pages, so it's not heavy-going, yet it imparts a great deal of wisdom. The inspiration section is good to flick through, although it's difficult to cover itineraries in depth without featuring any actual itineraries (obviously, as they'd be out of date by the time the book is printed). Still, there are plenty of suggestions on the best destinations for beach lovers, families, culture lovers, and those that love a sense of adventure. You can then make a shortlist of places you want to visit and marry these to real itineraries. The remainder of the book (just shy of 80 pages) focuses on the various regions around the world you can expect to find a cruise ship. Each region gets around 6 pages of coverage which gives a reasonable overview. These are a very high-level accounts for each region so if you know you want to visit Antarctica for instance, you'll definitely want to buy an Antarctica guide book to provide more depth. That notwithstanding, the content in this book serves as a good overview to whet your appetite for travel. Inside this section, I particularly liked the addition of guides on around the world cruises, as well as guides on European, American, and Asian river cruises. The latter are areas often omitted by many cruise guidebooks that instead choose to focus solely on ocean cruises. River cruises aren't quite as on-trend as ocean cruises, but thanks to the likes of U River Cruises and Emerald Waterways, river cruises are slowly catching up. The book is a fun and lively introduction to cruising holidays. It doesn't drone on and doesn't patronise. The overall book design is beautiful and begs you to turn from page to page. It's an absolute pleasure to read and to look at the stunning photography throughout. This book actively promotes the notion that cruising isn't only for older people any more, and that cruise holidays are actually good fun. Expect to find many hint and tips for all types of cruise traveller, including solo passengers and families. The overviews of cruise destinations are ideal for drawing inspiration for your first or next cruise. I would like to see a section on multi-generational cruising added to explain that generations of the same family can enjoy very different holidays on the same ship at the same time. This is an area of the market that is growing in popularity to such an extent that cruise lines are building multi-generational cabin configurations into their latest ships. As a gadget geek, I'd also like to see a section of new tech on cruise ships. In the last few years the technology has come on in leaps and bounds, and some cruise lines are embracing new tech with open arms. From MSC's Zoe voice commands to Royal Caribbean's robotic bartenders, I think this is worthy of a couple of pages in the book. I've been on a few cruise ships in my time, although thanks to the cost of school holiday cruises, they are fewer and far between right now. While this book is very much aimed at millennials who have yet to experience the joy of a holiday at sea, it is also great for seasoned sailors to flick through for inspiration on where to sail next. If you already know you want to sail to Alaska, for example, you'd be better off buying a dedicated cruise guidebook to Alaska. But if you need help narrowing down your options, this book is a great tool. The quizzes and tips lists are useful for identifying what options are most likely to suit you the best. 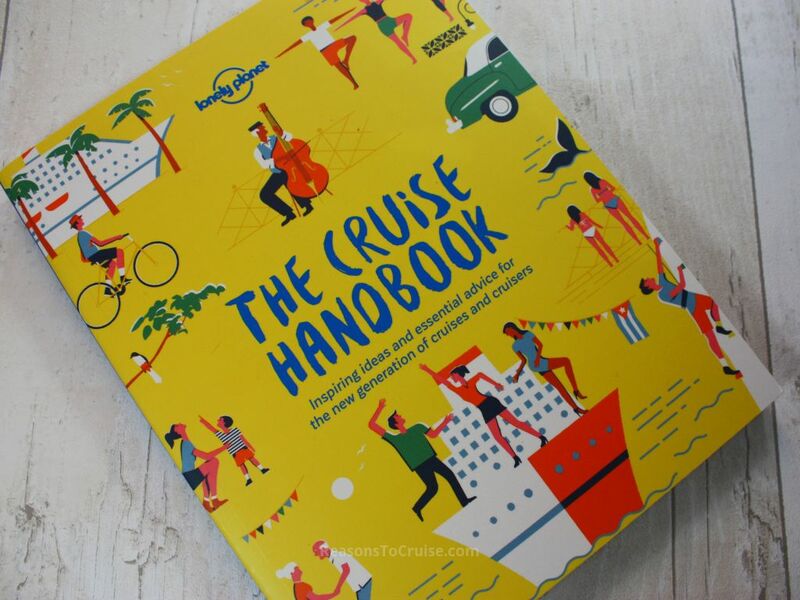 You can buy The Cruise Handbook from Amazon° (ISBN: 9781788681032). It has an RRP of £12.99. It's available as a paperback book as well as a digital Kindle edition too. What information would you most like to read in a cruise guide book? Let me know in the comments below. Disclosure: Lonely Planet send me a copy of The Cruise Handbook. I was not asked for a review. My opinions are my own. This book is clear, concise, and very well-written with wide appeal. It contains depth on various topics of taking a cruise holiday without being dry and boring. I’m happy to have this in my collection of cruise books.